Jivamukti Yoga, Mantra-Meditation, Creative Nature Walks, Healthy Food, and of course Great Company! – Do you find that your meditation practice comes and goes? – Do you sometimes feel like your yoga practice isn’t good enough, because life can sometimes get in the way and take you off track? – Do you feel more inspired when you spend time with other like minded people? – Would you like a day of that blissful feeling you get after yoga and kirtan? Andrea is an Advanced Jivamukti teacher and a mentor on the Jivamukti 300 hour trainings, a 500hr Senior yoga alliance teacher and Level 2 yin yoga teacher with Insight yoga. She is also certified to teach Restorative yoga. Jayadev John Richardson was part of the Rubettes between 1974 and 1979 where he enjoyed chart success with a string of hit records. Later, Jayadev left the band to pursue his interest in spirituality. Since then, he has dedicated his life to helping others through music, and now runs a mindfulness workshops and mantra choirs across the world in over 30 different countries. What will you need to bring on the day? A yoga mat and if available yoga brick, belt, blanket and of course a warm heart and something to take notes on. 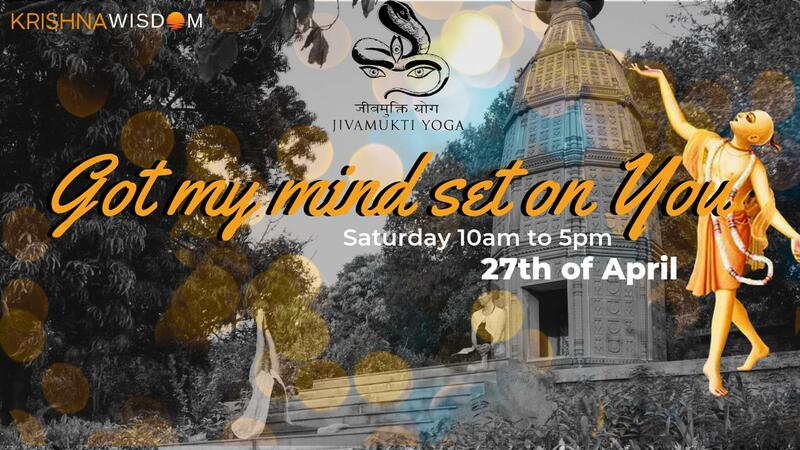 Hope to see you at ‘Got my mind set on you’ – A day retreat all about Krishna in our lives and how we can focus on Him, His blessings, and seva or giving back with compassion.